Photograph by Andrew Haberbosch. 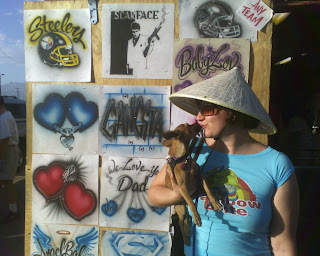 Eva and Frida at the Tanque Verde Swap Meet. Tucson Weekly is compiling the votes for 2008 Best of Tucson. Click here to cast your vote for Tucson Querido as Best Local Blog. 1. I don't blither on and on with irrelevant details about my personal life. Usually. 2. I cover the stuff you wouldn't find out about otherwise. Sometimes. 3. I rarely use my blog to give a bad review and get back at an establishment for a horrible experience. Rarely. 4. I won't suggest a place unless I personally really enjoyed it. 5. I have eclectic taste. 6. I'm a good photographer. 7. I didn't delete your blog from my blog roll, even if you did insult me while you were drunk at a show. 8. This site's easy to read and navigate, if nothing else. 9. I tell it like it is, mostly. 10. You're hip because you read my blog, and you want the world to know it. 11. 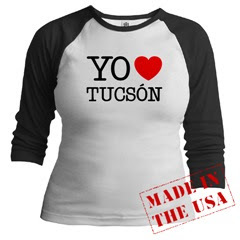 You love Tucson so much, you designed a t-shirt. Also, the photograph setup was your idea, i just took the photo. I would vote for your blog twice if you would delete the drunken insulters from your links. I have a link to your blog on mine and would love to an interview with you on my blog.